On December 17, Japan - Serbia Culture Exchange Association celebrated two years of it’s foundation. This event took place at the "Imperial Hotel", with around 100 members attending. Ambassador Ivan Mrkić, Association President Takeshi Ushiyama and Secretary-General Slobodan Mijalković addressed the guests. A video presentation of Belgrade was included in the program. 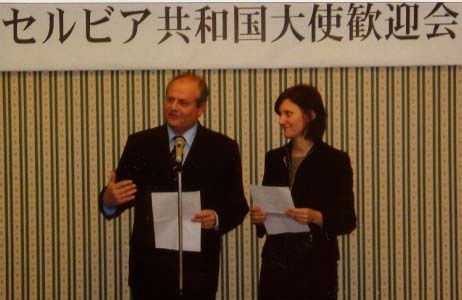 Japan - Serbia Association, the oldest of the three existing friendship associations, established fifty years ago, organized a reception in honour of the newly arrived Serbian ambassador, Ivan Mrkic, on December 13, 2006. President of the Association, Prof. Dr Shosaku Tokunaga, welcomed Ambassador Mrkic and his family and emphasized decades long devotedness of his Association to the strengthening of overall ties with Serbia. Secretary General, Prof. Nobuhiro Shiba, and President of the Board, former Ambassador of Japan to our country, Noriaki Owada, also greeted the guests. Ambassador Mrkic addressed the gathering, expressing appreciation for significant contribution of the Association to the friendly relations existing between Serbia and Japan. Ambassador of Serbia to Japan, H. E. Mr. Ivan Mrkic, paid a courtesy call to Mr. Yohei Kono, Speaker of the House of Representatives in the National Diet of Japan on December 11, 2006. Mr. Kono expressed readiness of the Japanese side to promote parliamentary cooperation with Serbia, with an aim to contribute to further development of overall bilateral cooperation. At the meeting in the House of Councilors of the National Diet of Japan, on December 13, 2006, Serbian Ambassador to Japan H. E. Mr. Ivan Mrkic and Ms. Chikage Ogi, President, discussed various issues related to the intensifying of the parliamentary exchange, political dialogue and other fields of bilateral cooperation between Serbia and Japan. The most recently founded friendship association between two countries, Japan - Serbia Exchange Association, organized a warm welcome reception in honour of the newly arrived Serbian ambassador, H.E. Mr. Ivan Mrkić, on November 29, 2006. Mr. Takehiro Togo, President of the Association, greeted Ambassador Mrkić and his family wishing them pleasant and fruitful stay in Japan. Mr. Kenzo Yoneda, Chairman of the Board, also delivered a speech making a tost. Among other guests and members of the Board, Mr. Naohide Ueyama, Honorary Consul General of Serbia, was also present. Ambassador Mrkic addressed to the guests, thanking for past and future opportunities to strenghten friendship and cooperation between our two countries in which the support and effort of this Association is highly appreciated. Dr Masayuki Iwata, respectable scholar and distinguished professor at the Tokyo International University, was elected honorary member of the Serbian Academy of Sciences and Arts. 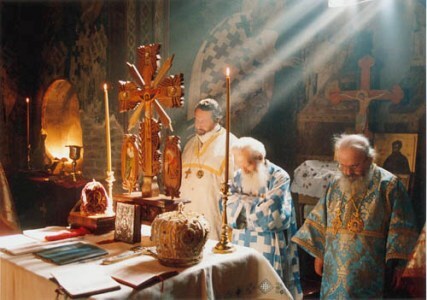 A four-day special exhibition of Serbian Orthodox Church fresco replicas and legacy photos under the title "UNESCO World Heritage - Serbia" was held in the Municipal Gallery of Meguro Museum from November 22nd till November 26th . This event also included a lecture in Japanese on Serbia’s cultural heritage by Ms. Aleksandra Kovač, Third Secratary (November 26th). In the same period, a separate exhibition of children’s drawings from both Serbia and Japan was also held in the Municipal Gallery. 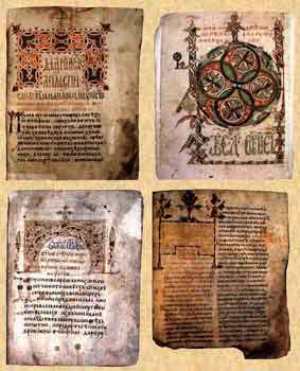 The exhibition's main purpose was to commemorate UNESCO World Heritage Committees decision to extend the site inscribed on UNESCO's World Heritage List in 2004 in Serbia (see UNESCO Decision). The new ambassador of the Republic of Serbia to Japan, H.E. Mr. Ivan Mrkić, presented the Letters of Credence to His Imperial Majesty Emperor Akihito on October 18, 2006. 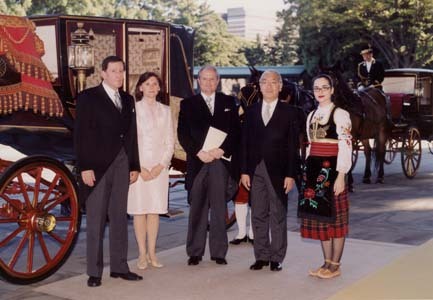 Ambassador Ivan Mrkić was accompanied by Counsellor Mrs. Snezana Janković, Counsellor Mr. Nebojsa Tasić and Third Secretary Ms. Aleksandra Kovač, who wore the Serbian national dress. Ambassador of the Republic of Serbia to Japan H.E. Mr. Ivan Mrkic was received on October 18, 2006 by the Senior Vice Minister for Foreign Affairs of Japan, Mr. Takeshi Iwaya. In a friendly and open atmosphere, Ambassador Mrkic and Senior Vice Minister Iwaya exchanged views on further development of bilateral relations, especially strengthening of the political dialogue, economic and all other fields of cooperation between the two countries. 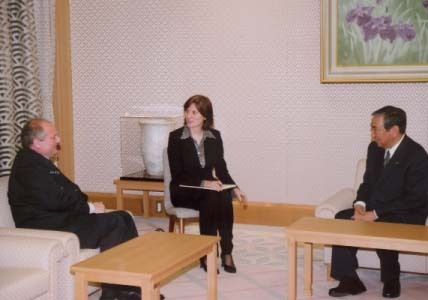 On October 18, 2006, Serbian Ambassador Ivan Mrkic had a meeting with Ms. Midori Matsushima, Vice Minister for Foreign Affairs. The possibilities for further enhancement of bilateral ties between the Republic of Serbia and Japan in various spheres were discussed. JICA Regional Office was moved from Vienna to Belgrade and on October 1, 2006 continued its activities in the capital of Serbia in promoting economic development of the countries of former Yugoslavia and Albania. The Government of Serbia acclaimed this decision as an important cornerstone in the further strengthening of bilateral Serbian-Japanese relations. Representatives of JETRO offices in European countries visited Serbia which was included in their tour of the region. They had talks with the Minister of Finance Mr. Mladjan Dinkic. The Vice President of Japan - Serbia Exchange Association Ms. Yasuko Hamada and Ms. Akiko Igaya visited cultural institutions and organizations in Serbia (September 29 – October 3, 2006) in order to explore prospects for further expanding cultural ties between the two countries. At Children’s Cultural Center in Belgrade, a special exhibition of children’s drawings from Serbia and Japan was officially opened on September 27 by Ms. Gorica Mojović, Deputy Mayor of Belgrade. This exhibition was jointly organized by this Embassy, City of Belgrade and International Kid's Art Association, as a follow-up to the children’s drawings contest held previously in Japan. For this occasion, 12 members of IKA and representatives of local Tokai TV visited Serbia (September 24-29), where they were warmly welcomed. As a result of their enjoyable experience, Tokai TV broadcasted a special report about their visit and IKA Association is already planning new exhibitions for promoting Serbia in Japan. The motto of this years Travel Fair was "Visit Undiscovered Jewels of Central and Eastern Europe". 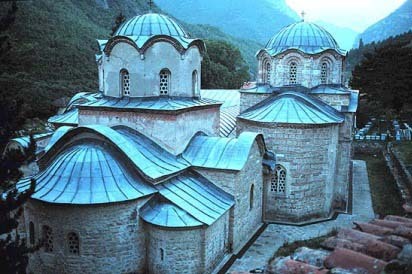 Serbia was portrayed as a tourist destination for the first time and attracted great interest. Congress delegates and exhibitors from Serbia were State Secretary for Trade, Tourism and Services Mrs. Gordana Todic and representatives of the Tourist Organization of Serbia and the Tourist Office of Belgrade. 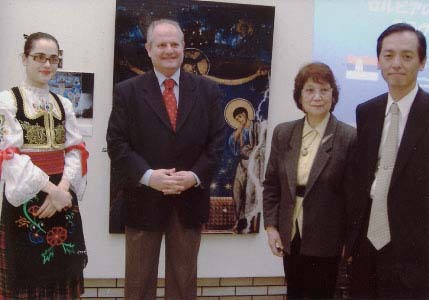 Eminent translator of Serbian literary masterpieces into Japanese, Professor Kazuo Tanaka, visited the Embassy on September 21, 2006, leading the group of Japanese citizens, admirers of Serbian literature. Ahead of their study trip to Serbia from September 27, 2006, the members of the group were given a presentation on Serbian culture, tourism and natural beauties, by Counsellor Mrs. Snezana Jankovic and Third Secretary Ms. Aleksandra Kovac. Ambassador Mrkic also greeted the guests, wishing them pleasant stay in Serbia. Ambassador of the Republic of Serbia to Japan, H. E. Mr. Ivan Mrkic gave an interview (available in Japanese) on September 14, 2006 to the renowned Weekly Magazine “Sekai Shuhou”, published by the Jiji Press News Agency. Famous scientist and inventor Dr NakaMats, a great admirer of world renowned scientist Nikola Tesla, a Serbian by birth, visited on September 19 the new Ambassador Mr. Ivan Mrkic who had recently taken up his duties in Japan. Dr NakaMats informed Ambassador Mrkic that he has been officially invited by the President of the Serbian Academy of Sciences and Arts Prof. dr N. Hajdin to visit Belgrade and attend ceremonies marking the 150-th anniversary of Tesla's birth (October 18-20, 2006). 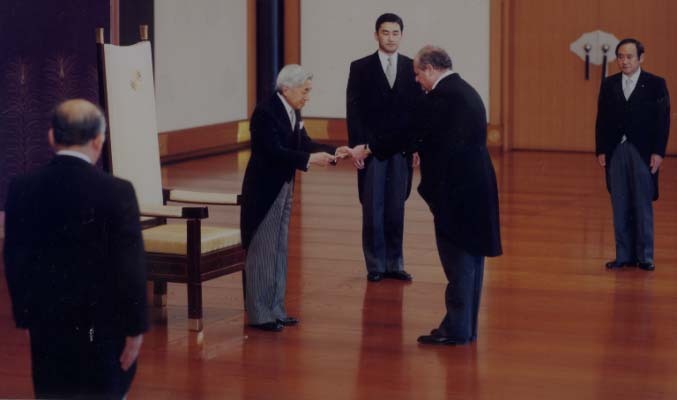 New Serbian ambassador to Japan H. E. Mr. Ivan Mrkic, in the presence of the Chief of Protocol Ambassador Minoru Shibuya, presented on September 12, 2006 the copy of his credentials to Mr. Shotaro Yachi, Vice Minister for Foreign Affairs of Japan. Mr. Yachi warmly welcomed new Serbian ambassador, expressing hope that the bilateral relations between the Republic of Serbia and Japan will be further strengthened during the mandate of Ambassador Mrkic. 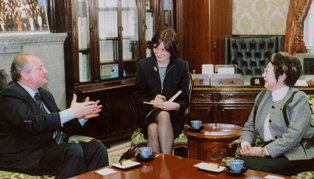 Dr. Aleksandar Popovic, Minister of Science and Environment Protection of the Republic of Serbia, visited Japan from 10th to 12th September 2006. During his stay, Minister Popovic participated in the International Symposium “Science and Technology in Society”, which took place in Kyoto, and had a number of bilateral meetings with the ministers and representatives of foreign scientific academies and institutions. At the meeting with Mr. Iwao Matsuda, State Minister for Science and Technology Policy, Minister Popovic expressed Serbian interest in intensifying scientific cooperation with Japan. Based on the Agreement on Scientific Cooperation existing between the two countries from 1981, Ministers Popovic and Matsuda agreed on the need to enhance scientific exchange, as well as to institutionalize the cooperation among the scientists of the two countries. Minister Popovic also held talks with Vice Minister for Foreign Affairs Ms. Akiko Yamanaka, Vice President of the Japan Agency for International Cooperation Mr. Tadashi Izawa, Senior Executive Director of the Japan Bank for International Cooperation Mr. Fujio Hoshi, President of the Science Council of Japan Mr. Kiyoshi Kurokawa, President of the Advanced Institute of Science and Technology Prof. Dr. Hiroyuki Yoshikawa and other dignitaries and important persons from the scientific circles in Japan. After attending the International Symposium on Plasma Physics (XXIII SPIG) on Mt. 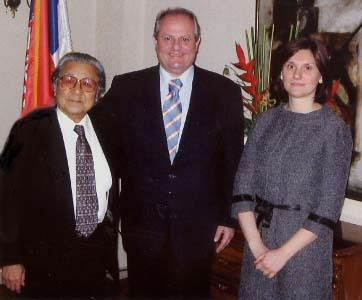 Kopaonik in Serbia, Prof. Motojima met with Minister Popovic in Belgrade on August 31, 2006. They discussed ways to promote scientific and technological cooperation between Serbia and Japan. One year after grand opening in Hiroshima, the exhibition of modern art masterpieces collection from National Museum in Belgrade finished its touring around Japan. Starting from September 2005 until the end of August 2006, 123 pieces of famous artists such as Renoir and Dega visited seven Japanese cities - Hiroshima, Kyoto, Miyazaki, Tokyo, Kochi, Niigata and Kanazawa. This unique opportunity to see one of 1100 foreign art collections from Serbian major museum, was greatly welcomed by Japanese public and media. This event was organized by Hiroshima Art Museum and Belgrade National Museum, with the support of this Embassy, Serbian Investment and Export Promotion Agency, ICC Broadcasting, major and local media and others. 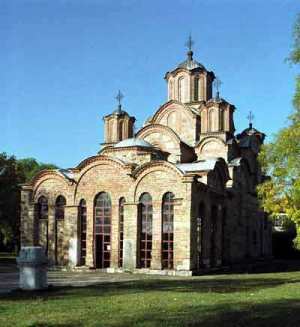 The UNESCO World Heritage Committee decided to extend the site inscribed on UNESCO's World Heritage List in 2004 as Dečani Monastery in Serbia by adding to it three sacral objects, namely, the Patriarchate of Peć Monastery, Gračanica Monastery and the Church of the Virgin of Ljeviška. 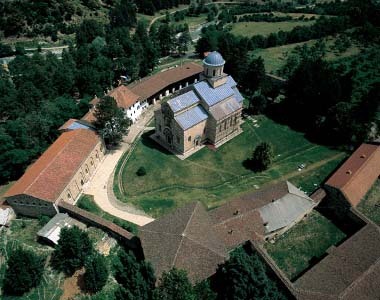 The site mainly dating from the 13th and 14th centuries, now known as Medieval Monuments in Kosovo, Serbia, was also placed on the List of World Heritage in Danger. Mr. Pajtic was a guest of the Ministry of Foreign Affairs, Japan. He met with Mr. Chikahito Harada, Director General for European Affairs (MOFA), Mr. Ryuichi Tanabe, former Ambassador to Serbia, Mr. Kentaro Kaneko, President of Japan Association of Travel Agents (JATA), Mr. Yoshitada Takahashi, Executive Vice President of JETRO, Mr. Kuniaki Nagata, Deputy Director General (JICA), Mr. Naohide Ueyama, Honorary Consul General of the Republic of Serbia and President of Dainihon Jochugiku Co., Ltd. and Mr. Hisashi Ueyama, Executive Director of Dainihon Jochugiku Co., Ltd. (KINCHO). 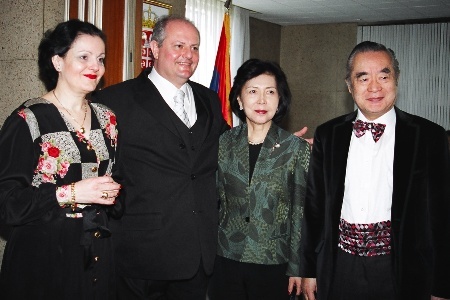 After a successful promotional tour in October-November 2005, organized by the Embassy and Aeroflot, in collaboration with the National Tourist Organization of Serbia (NTOS), the first organized group of Japanese tourists visited Serbia from May 22-28, 2006. The program was arranged by NTOS and "Miki Tourist" from Tokyo. "Japan Tobacco Inc." finalized the contract, worth 100 million US dollars, with the Government of Serbia on its purchase of Tobacco Industry Senta (DIS), north of Belgrade. After investing in the plant, JT will start production of license brand cigarettes in April 2007. Mr. Harada was also former President of Dowa Mining Co., Ltd. and Chairman of the former Committee for Economic Cooperation with Yugoslavia. Mr. Harada actively contributed to the promotion of relations between our two countries. He visited our country for the last time in July 2001, when he headed a Japanese business delegation which visited Belgrade. On the basis of the interview with Counsellor (Economic Affairs) of the Embassy Mr. Nebojsa Tasic, the Tokyo branch of "Goldman Sachs Asset Management Co., Ltd." published a presentation on Serbia in the March issue of their bulletin in Japanese. It was fifth among 42 planned to be published on various countries which are achieving rapid economic growth and meet the criteria of this bank as potential recipients of future investments. The presentation focuses on Serbia's positive macroeconomic development, high rate of economic growth, very favourable investment climate and incentives, rapid increase in foreign direct investments, positive debt rating and prospective areas for Japanese investors. It also highlights tourist attractions, culture, high educational level and national characteristics which have much in common with Japan.